Once again, I would like to thank you for an absolutely awesome day of trophy smallmouth fishing on Lake Mille Lacs. 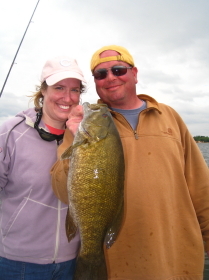 You exceeded my expectations with your guiding ability and hard work in putting my wife Beth and me on the fish. You set the bar high with all the pictures I viewed on your Web site before the trip, however you certainly delivered under less than ideal weather conditions. You are a true professional. Please let me know if you are available for another day next year around the same time as I’m already wanting to come back to chase Mille Lacs smallies!